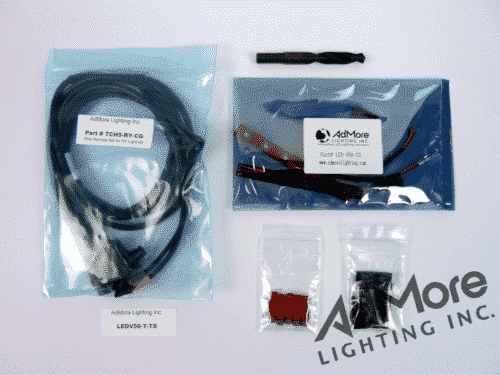 E470 TOP CASE - LED KIT (TS) - AdMore Lighting Inc. 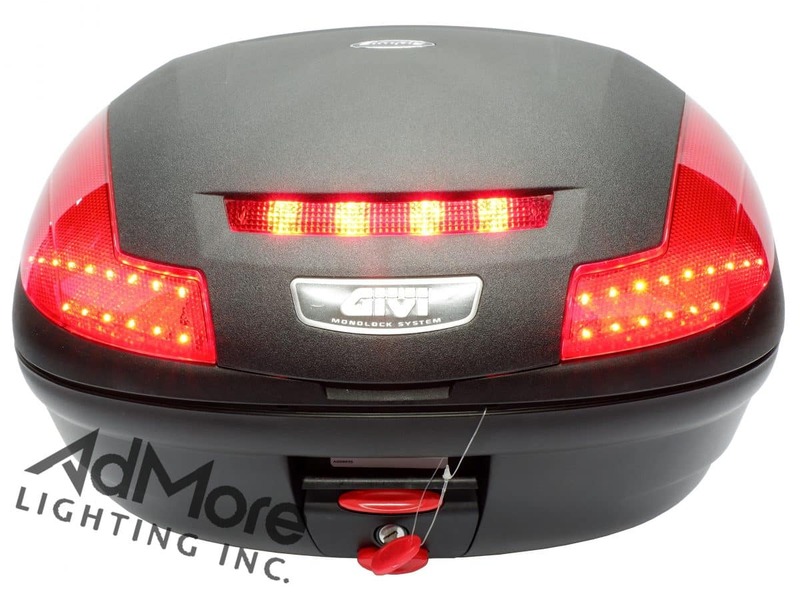 The LED470-T-TS light kit has been custom designed to fit the GIVI E470 top case. 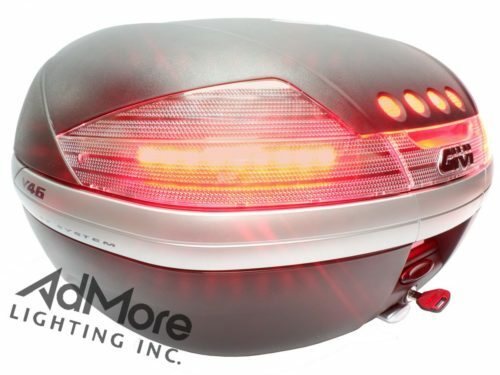 Each kit contains two high intensity LED light panels that fit perfectly behind the red lens of the E470 case to give you and your bike great wrap-around visibility! 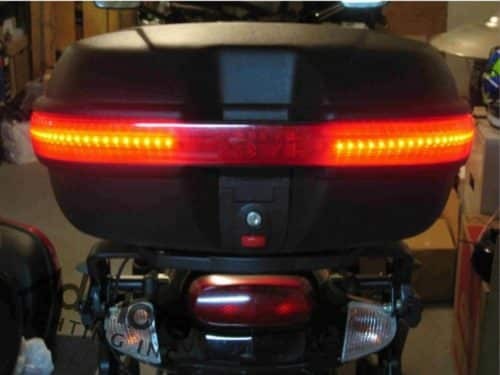 The mini controller allows you to connect the light kit to your bike’s tail and brake lights and turn signals! 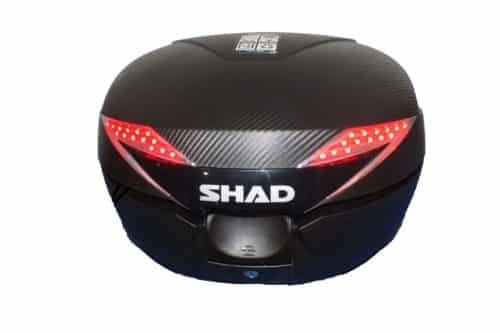 The case lights are always on when riding, the lights brighten when you apply the brakes, and the right or left side of the case lights flash with your turn signals! 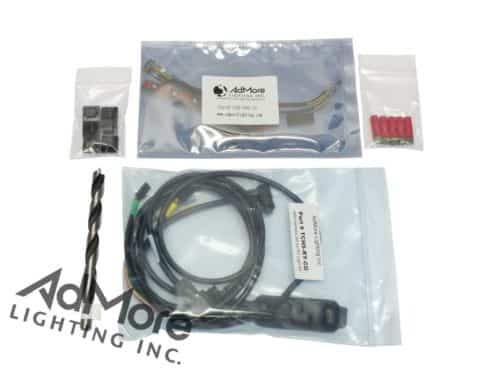 With this kit you receive: a single high intensity LED light board that fits perfectly behind the center red lens of the E470 case, two (2) high intensity LED panels (one right, one left), one (1) mini controller (with turn signal functionality) embedded in main wire harness, wiring and weatherproof quick-disconnect connectors and detailed instructions with guiding pictures. 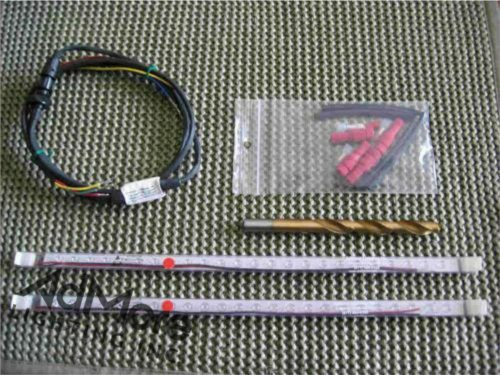 Installation is easy and can be done in an hour or two using basic tools! 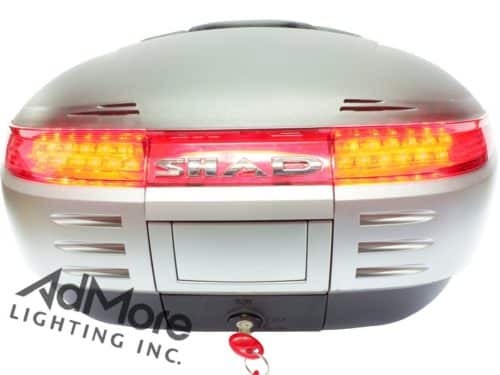 You will not ride unnoticed with this light kit installed in your E470 top case! 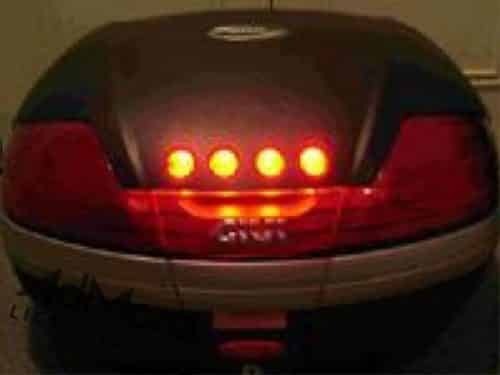 Only looking for tail light and brake light functionality (i.e. no turn signals)? 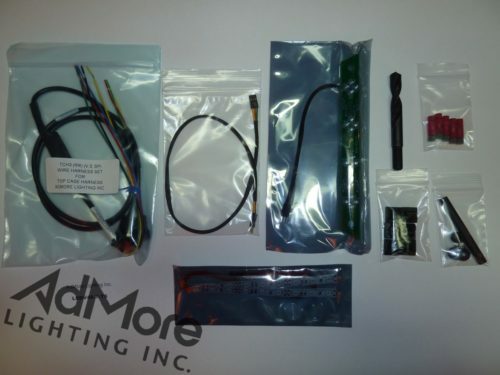 Then the LED470-T is the kit for you! 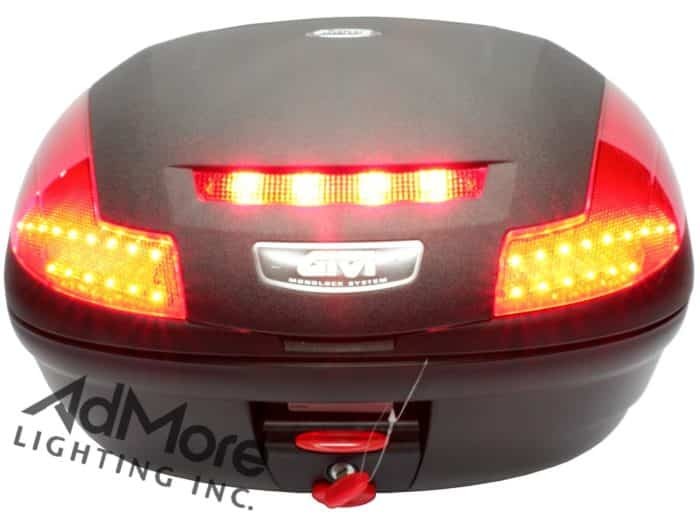 ust prior to a recent 1,500 mile trip on my Honda Big Ruckus Scooter, i received my long wanted AdMore LED lighting kit for my Givi E470 Top Case. All i can say is WOW! 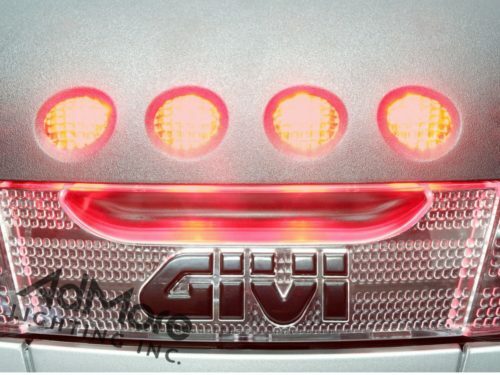 While the Givi Top case lighting kit provides what i would call adequate lighting for the top case reflector, your well designed and easily installed lighting kit is unbelievable. It is incredibly bright and i feel more comfortable about being seen in both daylight and night conditions. The 6 month wait while the product was being developed was well worth the wait. During my recent trip i was often asked about the product and could only boast about how happy i was. So thanks for getting this out and into my hands!